Less is more – it takes only about a quarter of a pump to adequately fill each tray. You can spread it around with a finger prior to placement over teeth. 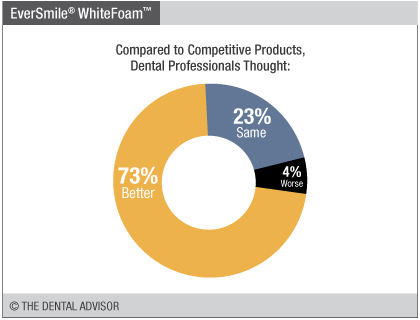 Still have the patient use a denture cleaner if there is tartar on the appliance. I would recommend doing this daily for stains and avid coffee and tea/wine drinkers. 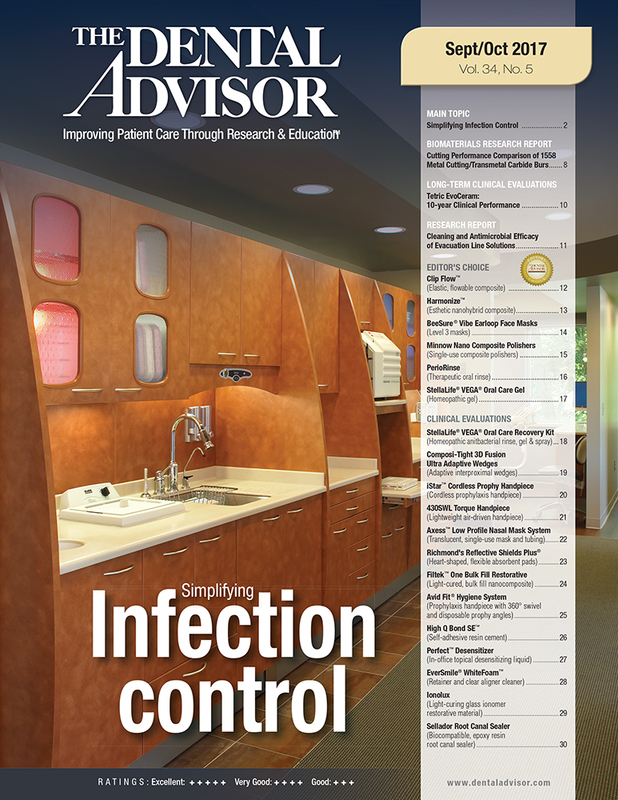 Good for patients in Essix retainers. 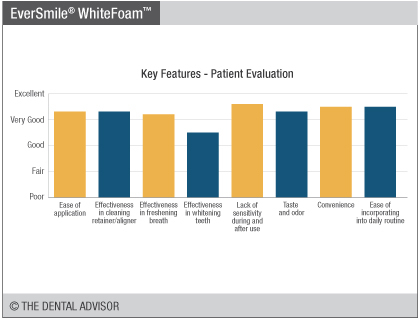 EverSmile® WhiteFoam™ was evaluated by 22 consultants, with a total of 392 uses. 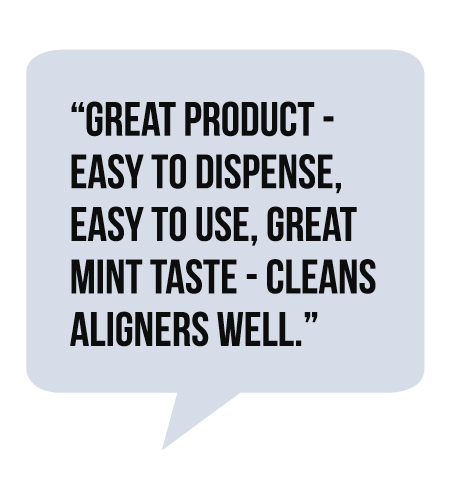 Effective at cleaning retainers and aligners. Does not alter the fit of the appliance. No sensitivity during or after use. Utilizes EverClean™, an anionic cleaning technology with 3.8% hydrogen peroxide. 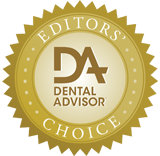 EverSmile® WhiteFoam™ contains EverClean™, an anionic cleaning technology with 3.8% hydrogen peroxide. 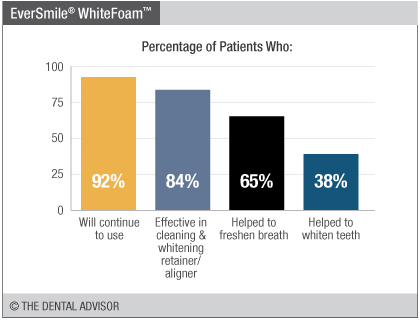 EverSmile® WhiteFoam™ is designed to clean retainers/aligners and to whiten teeth while the retainer/aligner is being worn. 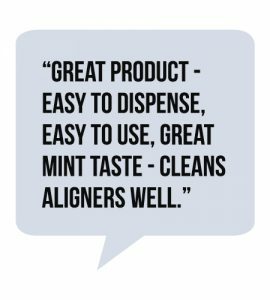 The foam can be used up to 4 times daily while the appliance is being worn or as an overnight soak for the retainer/aligner. The foam will whiten teeth even underneath attachments. The bottle should be stored away from direct sunlight and heat. 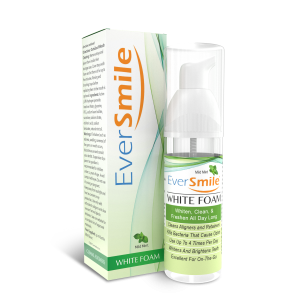 EverSmile® WhiteFoam™ is mint-flavored and supplied in 50 mL bottles, which is sufficient for 60 applications.